excursions and the summit of Mount Lineham. Since all of these hikes are connected by a common trailhead, we've combined all of this information onto one page. 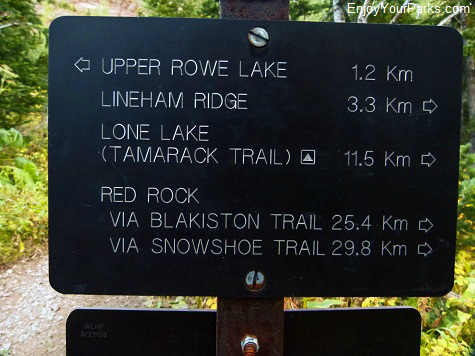 Rowe Lakes and Mount Lineham are day hikes, whereas the hike along the entire Tamarack Trail is generally considered to be a multi-day hiking adventure. 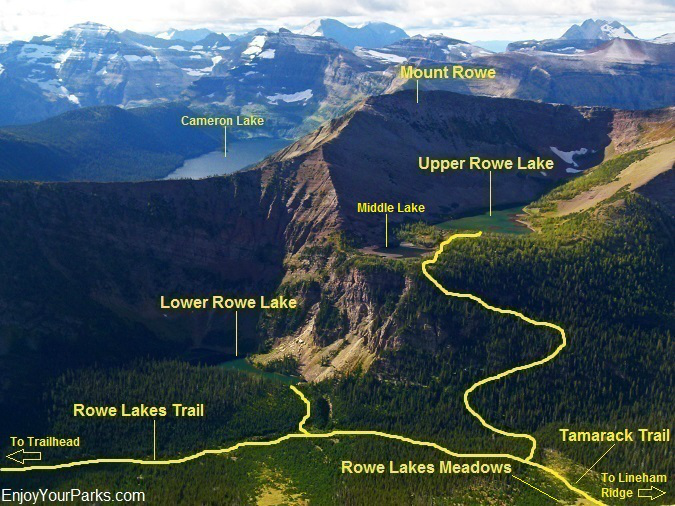 The trailhead to the Rowe Lakes Trail and Tamarack Trail is located along the Akamina Parkway in Waterton Lakes National Park, just a little past halfway between Waterton Park Townsite and Cameron Lake. There is a large trailhead sign that says "Rowe-Tamarack" to your right, and there is a parking area next to the trailhead sign. The first portion of the hike takes you along the north bank of Rowe Creek through a nicely forested area, initially made up of lodgepole pines. In about 1.7 miles you will reach a large avalanche area where the view really opens up for you to see Mount Lineham to the immediate north, and Mount Rowe to the south. As you continue on, you'll pass by a nice waterfall on Rowe Creek as you work you're way through a pleasant sub-alpine fur forest. 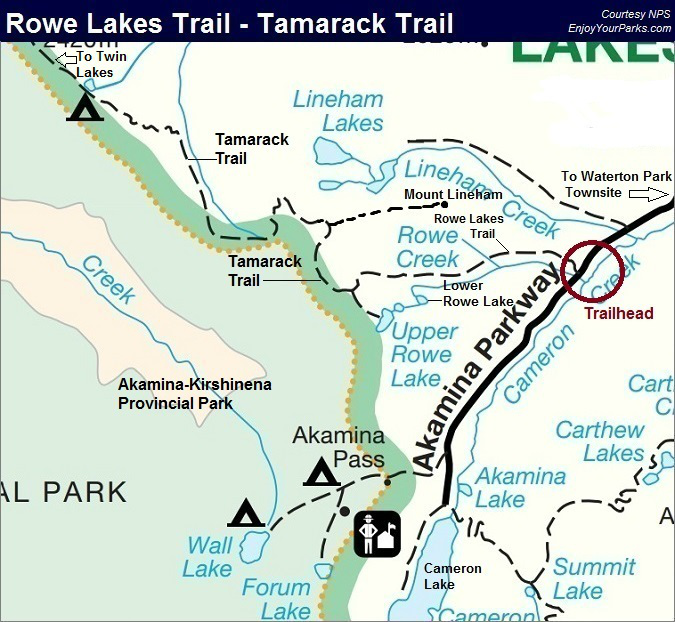 At mile 2.4 you will encounter the Lower Rowe Lake Trail junction. Take a right to take this short 0.3 mile spur trail to Lower Rowe Lake. Lower Rowe Lake is a rather small but scenic lake, and is a great place to enjoy a snack. Lower Rowe Lake in Waterton Lakes National Park. 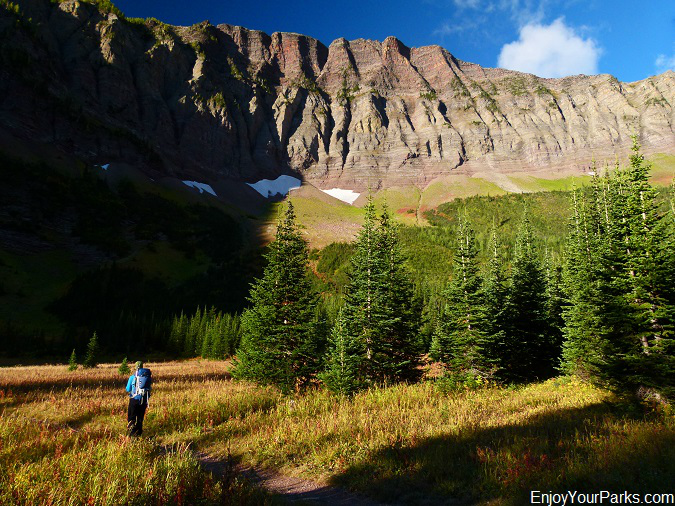 Between Lower Rowe Lake and the Upper Rowe Lake Trail Junction in Waterton Lakes National Park, you will hike along a mossy woodland, with small cascades and waterfalls flowing down Rowe Creek. Green moss is thick along both sides of Rowe Creek along this beautiful section of the trail (see photo below). Rowe Creek along the Rowe Lakes Trail in Waterton Lakes National Park. Once you've taken in the view at Lower Rowe Lake, head back up to the main trail and continue onward along the main Rowe Lakes Trail to the west. This stretch is really beautiful as you will hike through a mossy woodland with Rowe Creek directly beside you. 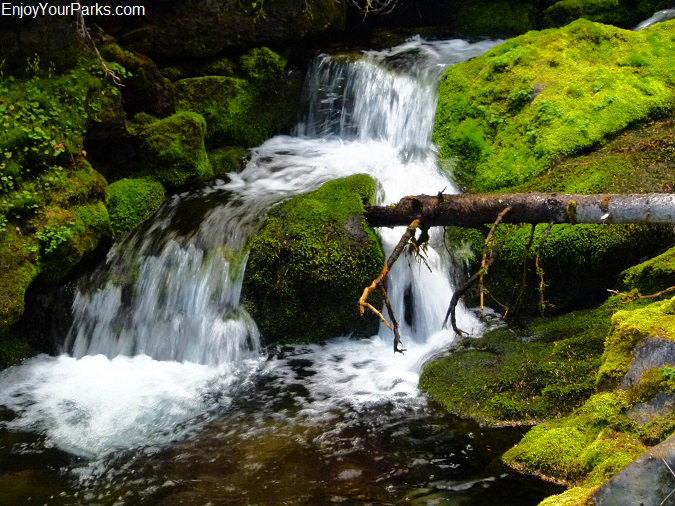 There is bright green moss surrounding the creek, and there are several nice cascades that are really enjoyable to witness. 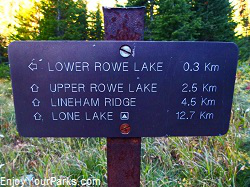 About 0.8 miles beyond the Lower Rowe Lake Trail junction, you will reach the Upper Rowe Lake Trail junction (mile 3.2). To visit Upper Rowe Lake, take a left here. The trail is very steep as it gains about 735 vertical feet in less than a mile. In fact, most of this vertical gain is along the first half mile. 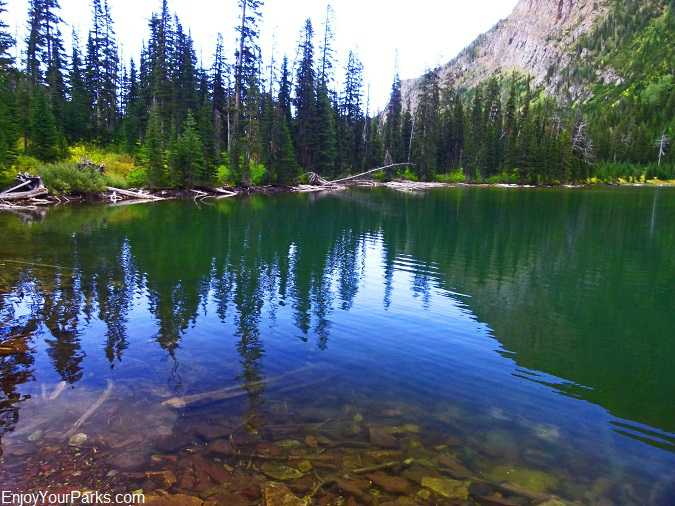 Once you crest the ridge, you will hike into a beautiful larch forest as you first encounter a small lake known as "Middle Lake", and then shortly after that you will find yourself on the shore of Upper Rowe Lake. Towering above you to the south is Mount Rowe. 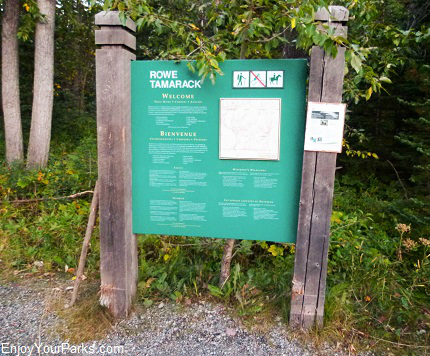 The Upper Rowe Lake Trail Junction at mile 3.2 also marks the official beginning of the Tamarack Trail. Stay right at this junction to continue onward along the Tamarack Trail and also to the summit of Mount Lineham. You will initially hike through a very pretty area known as "Rowe Meadows". These meadows are lush with grass and during certain times of the year are blanketed with wildflowers. The Tamarack Trail will continue through these beautiful meadows and begin working its way up the side of a red-colored rocky slope as it slowly turns northward toward Lineham Ridge. 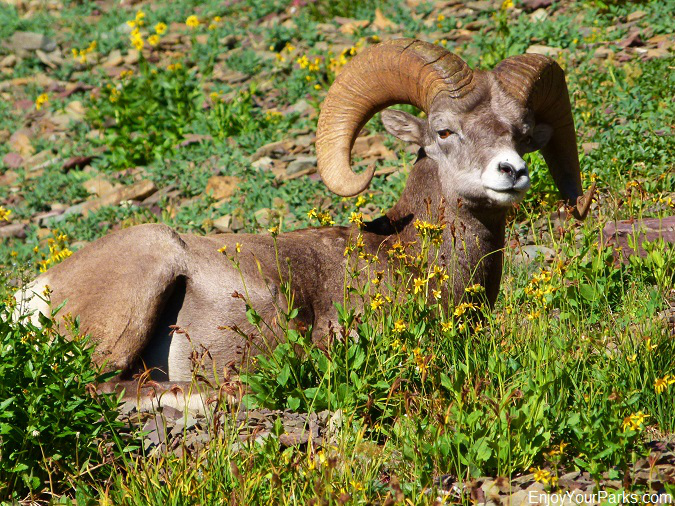 Keep an eye out for bighorn sheep in this area, as this is a favorite hang out for bighorn rams during the summer season. 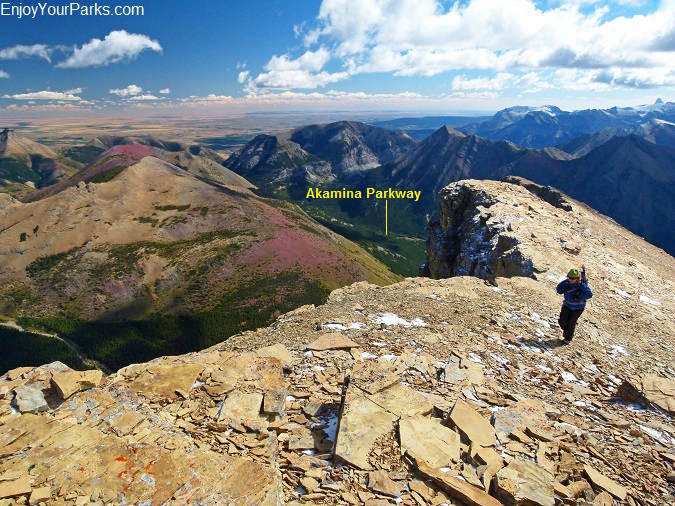 This is a view of the Rowe Lakes Area from the summit of Mount Lineham in Waterton Lakes National Park. Rowe Meadows along the Tamarack Trail in Waterton Lakes National Park. 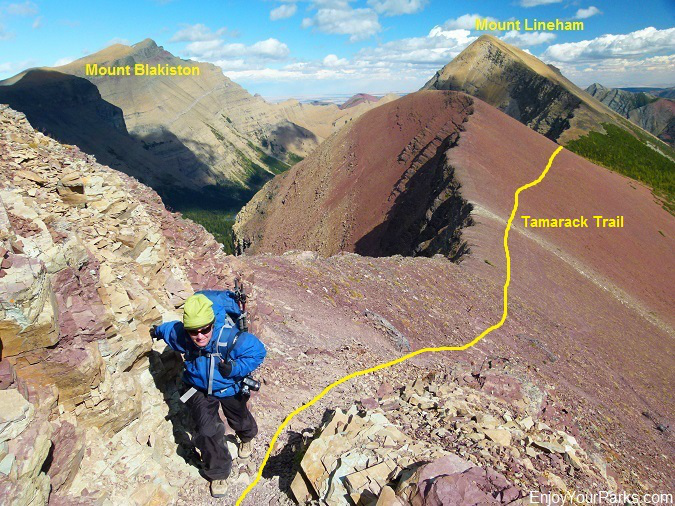 The Tamarack Trail in Waterton Lakes National Park gradually works its way up to Lineham Ridge, which is where the Mount Lineham Spur Trail is located. 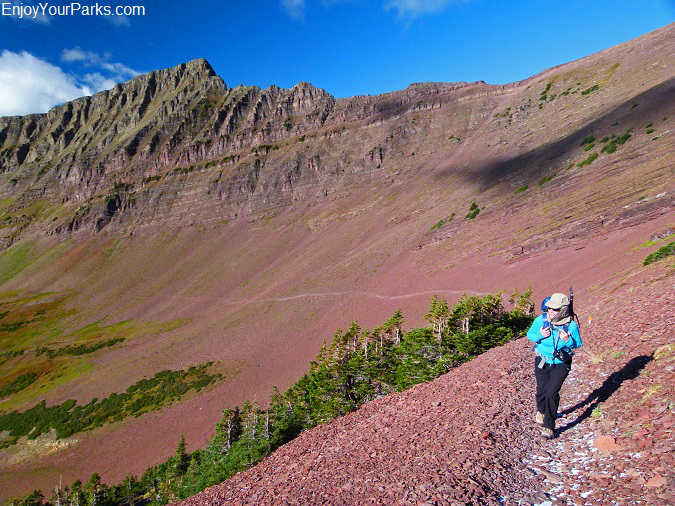 Shannon heading for Lineham Ridge along the Tamarack Trail in Waterton Lakes National Park. 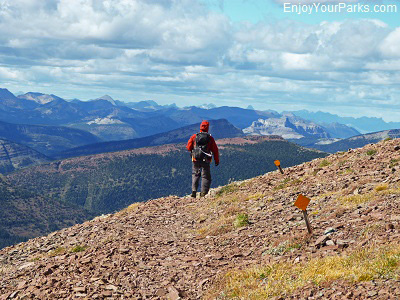 This is the view to the southeast from Lineham Ridge in Waterton Lakes National Park. The large mountain in the distance is Mount Cleveland, which is the tallest mountain in Glacier National Park. The Tamarack Trail gradually climbs up the red-colored rocky slope to the Lineham Ridge at mile 5.1. The view from Lineham Ridge is nothing short of amazing, and you will definitely be getting your camera out by now. Just before the ridge, you will see a well-used "climber's trail" heading toward Mount Lineham to the east. 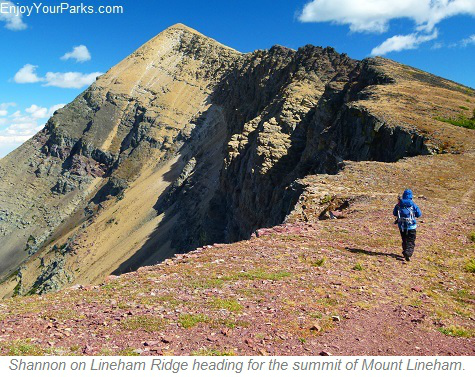 If you're goal is to hike up to the summit of Mount Lineham, take this trail to the right. Even though this is an un-maintained trail, it is fairly easy to follow as it works its way up the west ridge of Mount Lineham, eventually reaching the summit. The summit is about three quarters of a mile from the spur trail junction on Lineham Ridge (see photo above). Along the Lineham Ridge on your way to the summit of Mount Lineham in Waterton Lakes National Park, you will get great views of the Lineham Lakes far below you to the north. As you hike up the west ridge of Mount Lineham, you will get really nice glimpses of the Lineham Lakes far below you to the north (see photo above). These three lakes are quite remote, and very few people ever venture down there to explore them. The outlet of these lakes end up spilling off a huge headwall, thus creating Lineham Falls, which you cannot see from this angle. The views get better and better the higher in elevation you climb. The mountains to the south, beyond Rowe Creek Valley really begin to emerge, such as Kintla Peak, Kinnerly Peak and Mount Cleveland in Glacier National Park, Montana. You'll be enjoying the view so much that you won't even notice the work-out your body is getting as you climb toward the summit. 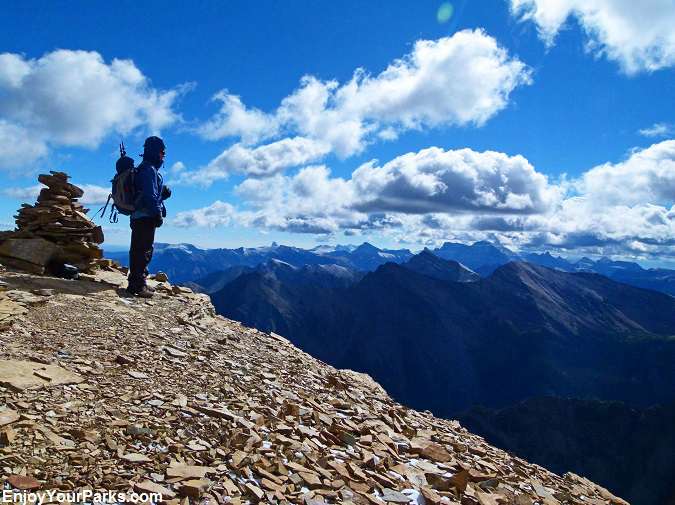 Shannon walking on the Summit of Mount Lineham in Waterton Lakes National Park. 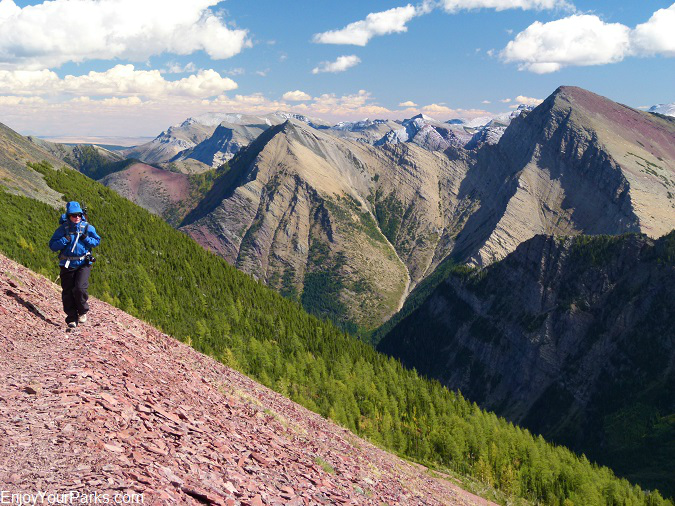 The views from the summit of Mount Lineham (Elevation 8,950 feet) in Waterton Lakes National Park are incredible in all directions, and you will definitely burn up several memory cards up here. 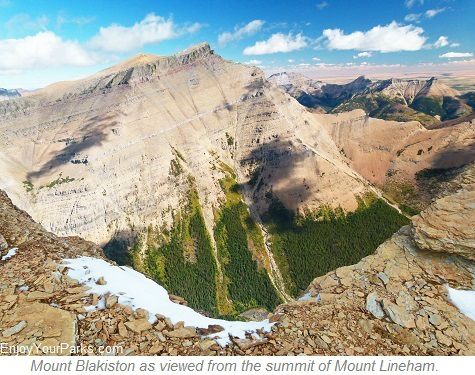 You will see Mount Blakiston directly to the north, which is the tallest mountain in Waterton Lakes National Park. You will also see the entire Rowe Creek Valley below you to the south. 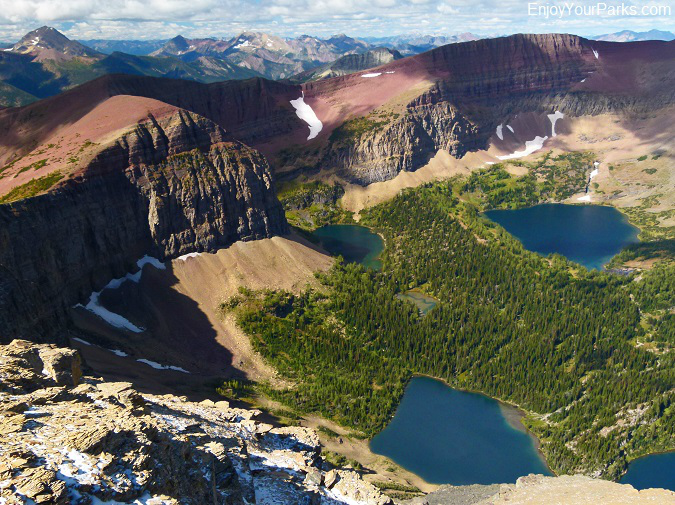 Beyond the Rowe Creek Valley, you will see an ocean of mountains that belong to Glacier National Park in Montana, including Mount Custer, Kintla Peak and Mount Cleveland. You will also get a unique view of Cameron Lake from up here, and well as the prairie far to the east. 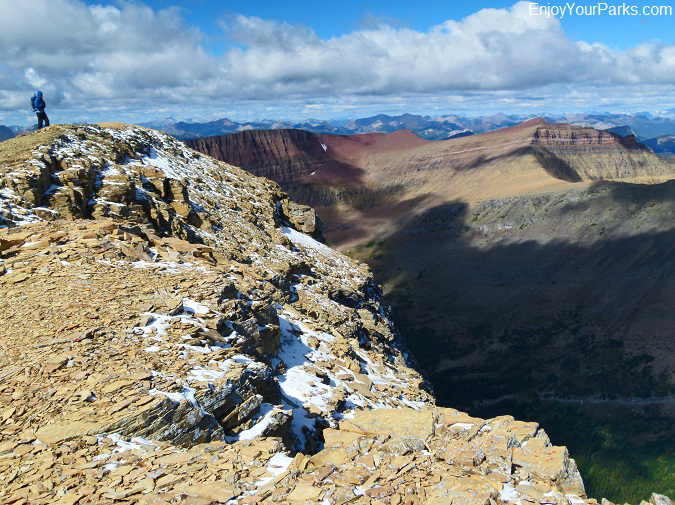 A view of the Lineham Creek Drainage from the summit of Mount Lineham in Waterton Lakes National Park. Each time we've been on the summit of Mount Lineham, the wind was unbelievable, so make sure you bring proper wind-blocking gear (pants and jacket), as well as a hat or head band to cover your ears and gloves to keep your hands warm. If you do this, the summit experience will be much more enjoyable. 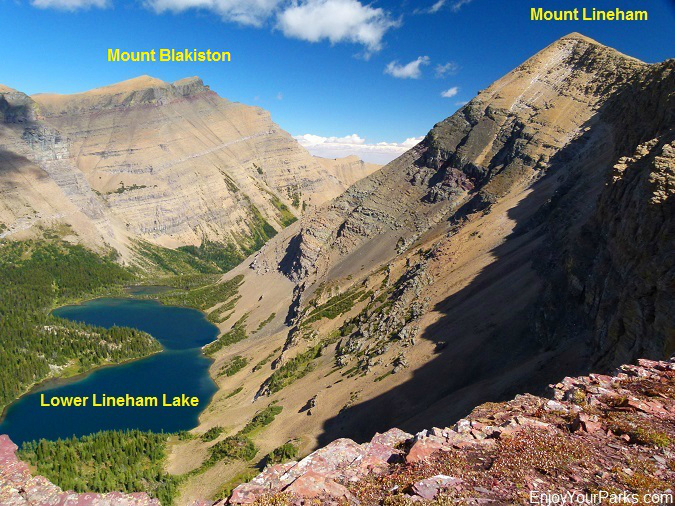 This is a view of Lineham Lakes from the summit of Mount Lineham in Waterton Lakes National Park. 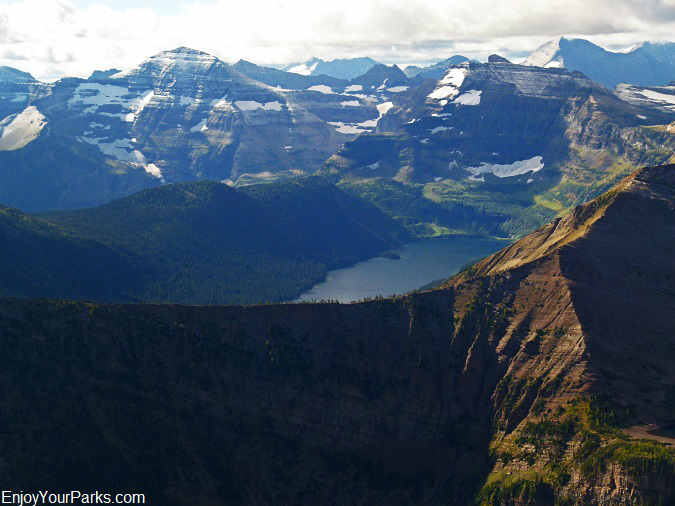 This is a view of Cameron Lake and the mountains of Glacier National Park from the summit of Mount Lineham in Waterton Lakes National Park. The camera is facing southeast. Shannon standing near the Mount Lineham summit cairn in Waterton Lakes National Park. From the Tamarack Trail at Lineham Ridge (where the Mount Lineham spur trail is located), the trail continues on along this great ridge and begins heading straight northward. 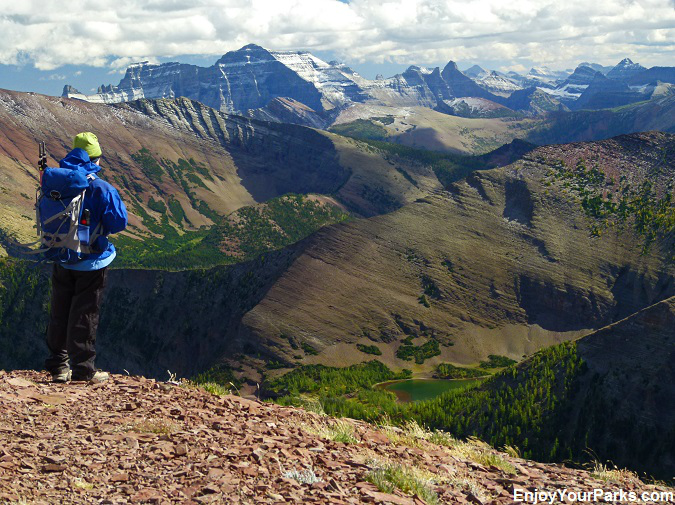 You'll be enjoying jaw-dropping views this entire section of this amazing Waterton Lakes National Park hike. You will see orange metal diamonds staked into the ground marking the trail. 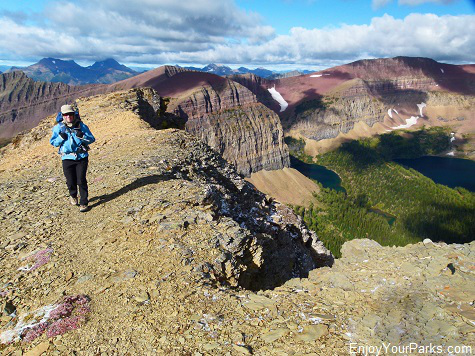 Shannon hiking on Lineham Ridge along the Tamarack Trail in Waterton Lakes National Park. 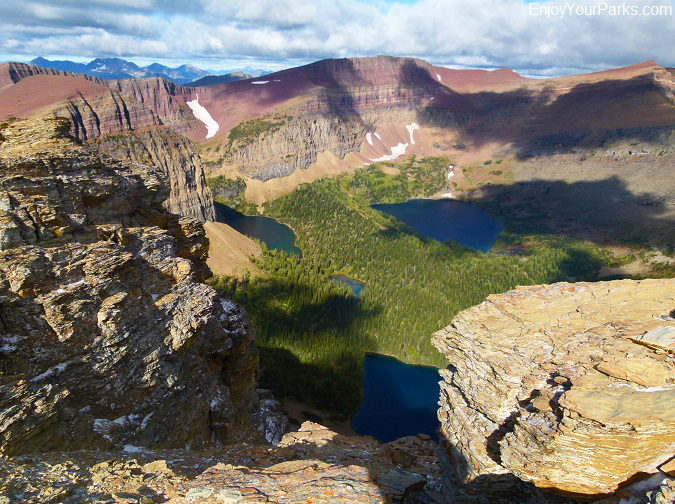 This is a view of Lower Lineham Lake from Lineham Ridge along the Tamarack Trail in Waterton Lakes National Park. 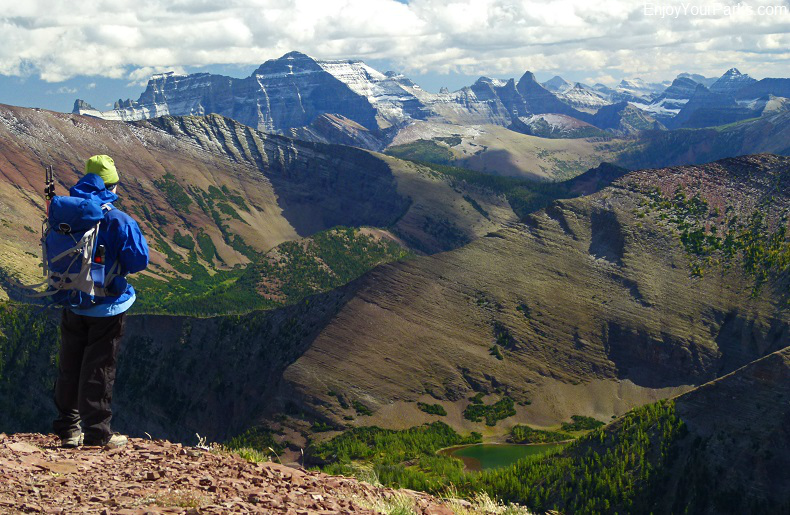 Shannon hiking west on the Lineham Ridge along the Tamarack Trail in Waterton Lakes National Park. Now, if you are wanting to continue on the Tamarack Trail on a multi-day hiking adventure, from the point of the trail that begins to head straight northward along the ridge. 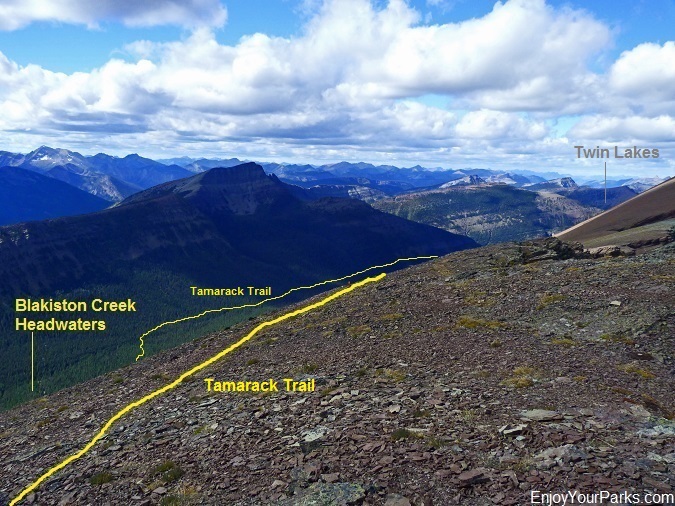 In about a third of a mile the Tamarack Trail then drops off the Lineham Ridge to the west, and descends abruptly through many switchbacks into the headwaters of Blakiston Creek. 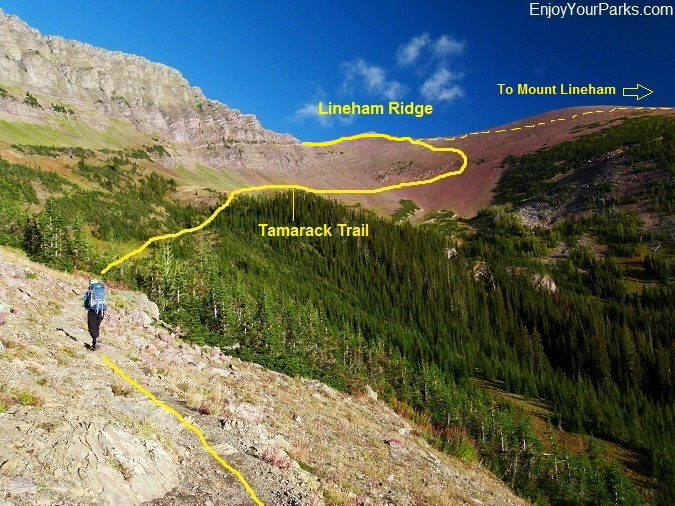 From there the trail follows the Blakiston Creek drainage northward until it eventually connects with the Blakiston Valley Trail in 13.7 miles, and eventually reaches Twin Lakes in 15.8 total miles from the Rowe Lakes Trailhead. At Twin Lakes, you can continue on to connect with the Snowshoe Trail, which will eventually take you to the Red Rock Canyon parking lot along the Red Rock Parkway. The Tamarack Trail beyond Lineham Ridge is obviously designed for multi-day hiking excursions. The Tamarack Trail drops off the west slope of this ridge, and ends up at the bottom of the valley where the Blakiston Creek Headwaters are located. The Tamarack Trail then heads down this long drainage northward until it connects with the Blakiston Valley Trail and eventually the Snowshoe Trail, both of which takes hikers to the Red Rock Canyon parking lot along the Red Rock Parkway. We photographed this bighorn sheep along the Tamarack Trail just above Rowe Meadows.